The labyrinth has been around for centuries in many different cultures and religions. It has been used outside in very large settings. It can also be drawn on a paper, or downloaded and copied on paper. I use a labyrinth as a client warm up in the sand tray. This helps my clients get used to the sand tray process. They enjoy the warm touch of the sand and the ability to manipulate and control the sand. A labyrinth can help your client focus and get in touch with their spiritual side. It can help a client find balance in their life. The labyrinth is clearly not a maze because a maze is created to trick the mind. The labyrinth has openings and many ways to escape. With the labyrinth the client simply begins to relax. When they relax they start talking and thus begin the therapeutic process. It is very important to begin the therapy session with a warm up. 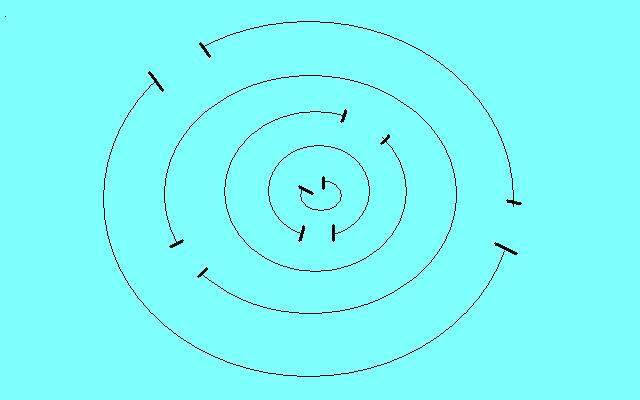 A therapist can actually see their client relax the first few minutes of the labyrinth warm up. There are those that believe that the labyrinth is an opening to the collective unconscious. I believe that there are many ways to open this portal to the mind. The sand tray is also a way to open the collective unconscious. Labyrinths can be purchased online. They can be made from wood and the client simply follows their finger from the beginning to the end of the labyrinth, and then back through it again. There is also a dual labyrinth called the “Therapist Board” in which two labyrinths are laid side by side and the therapist completes the one side of the labyrinth, while the client completes the other side of the labyrinth. The two warm up together, in sync. My favorite way to do the labyrinth is in the sand tray. Quite often, before a session I will draw a labyrinth with my finger in a blank sand tray. I will offer this labyrinth to the client to see if I can encourage the client to try the labyrinth in the sand tray. What I find is that the client will continue on to do an actual sand tray to expand on the therapy process. Creative Counseling 101 eBook: Our Best Seller! Learn how to be a more Creative Counselor / Therapist with the book that started it all! Learn step by step therapy with over fifty-five creative counseling and therapy techniques and activities. 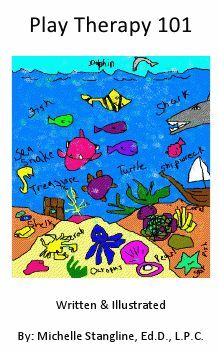 Includes full color reproducible worksheets with most activities. 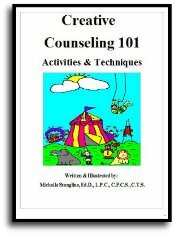 Get your complete set of the Creative Counseling 101.com eBooks by Dr. Michelle Stangline for only $98.95, that's only $25.00 per eBook (Regular Price is $39.95). 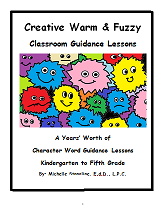 Get a year's worth of school counselor's guidance lessons, character education words, and social stories! Complete with lesson plans and behavior incentives. This ebook includes 252 pages of step by step group therapy ideas for school counselors and professional therapists. 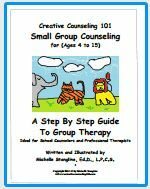 Group topics include grief, anger management, friendship, self-esteem, positive behavior, and stress management with colorful, reproducible worksheets. Learn about the creative sand tray therapy process. This is an exact replica of the graduate sand tray therapy class I teach at a major university in Atlanta. 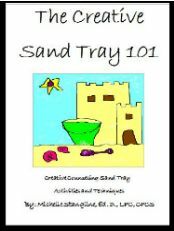 You get 147 pages of creative ways to do sand tray therapy. Also included are colorful, reproducible worksheets for your clients to use and take home. You can now learn everything I teach to graduate counseling students with this Creative Play Therapy eBook. The eBook has 25 sessions (181 pages) with step by step colored lesson plans and reproducible worksheets. Learn how to use the play therapy doll house, puppets, miniatures, miniature worlds, the sand tray, and more! If you work with children or teens then this book is a must have item for your practice. Download your Play Therapy 101 eBook today!